School extracurricular activities have been shown to boost educational achievement and personal development, but barriers to participation prevent some children from realizing these benefits. The C.S. 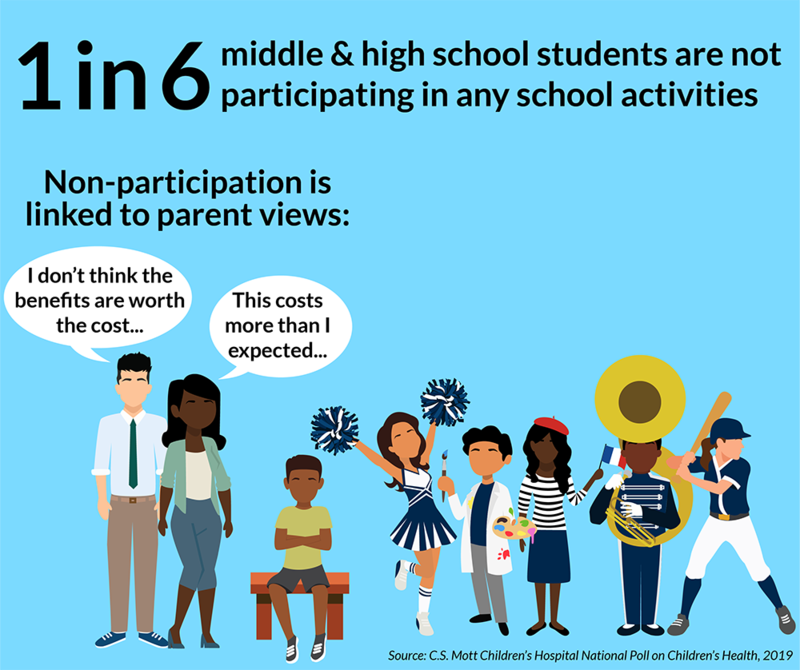 Mott Children’s Hospital National Poll on Children’s Health asked a national sample of parents of children in middle and high school about participation in school activities. Parents reported that over 80% of their middle and high school-age children would participate in at least one type of school activity for the 2018-19 school year, including 52% in sports, 43% in arts activities, and 51% clubs/other activities. Nearly half (46%) of middle and high school-age children were expected to participate in more than one type of school activity. Required school participation fees averaged $161 for sports, $86 for arts, and $46 for clubs/other activities. For sports, 18% of students had school participation fees of $200 or more, compared to 12% for arts and 5% for clubs/other activities; there was little difference between middle and high school fees. In contrast, more students had a participation fee of $0 for arts (64%) or clubs (66%) compared to sports (46%). When combining participation fees with other expenses such as equipment and travel, the total cost averaged $408 for sports, $251 for arts, and $126 for clubs/other activities. Nearly 3 in 10 parents (29%) said the cost of school activities is higher than they expected. Ten percent of parents felt the benefits of school activities are not worth the cost, including three times as many lower-income parents (18% less than $50,000 vs 6% more than $100,000). Only 7% of parents had ever requested a waiver or scholarship for participation fees; 19% said they didn’t know how, and 5% were not comfortable making such a request. Parents reported that 18% of their middle and high school-age children would not participate in any school activities in 2018-19. Non-participation was higher among boys than girls (21% vs 15%), and for students from lower-income households (25% less than $50,000 vs 12% over $100,000). Reasons for non-participation cited more often for boys were cost, transportation, and having a job; not being interested in activities was cited more often for girls. Non-participation was three times higher for children of parents who said the benefits of school activities are not worth the cost, and nearly twice as high for children of parents who said the cost of school activities is more than they expected. Most middle and high school students participate in school sports, arts and/or clubs; however, 18% are not participating in any school activities. School sports are substantially more expensive than arts or clubs, with fewer no-cost options for participation. While 29% of parents say the cost of school activities is higher than they expected, only 7% have ever requested a waiver or scholarship for participation fees. School activities offer an array of benefits to middle and high school students: opportunities to explore different interests, make new friends, hone an existing skill or talent, and develop leadership and teamwork skills. Participation in school activities is linked to higher educational achievement. Participation in school activities is widespread. According to parents responding to this Mott Poll, over 80% of their middle or high school students are participating in a school activity for the 2018-19 school year. These activities range from exploratory options like intramurals sports or afterschool clubs, to higher-intensity options like varsity sports, competition arts groups, or student council. Many school activities have a fee to participate, and those fees can be a barrier to participation. Most schools strive to offer a range of activities, including some with no fees; in addition, many schools provide scholarships or waivers to assist students with fees. Despite these efforts, elevated rates of non-participation among lower-income students continues to be a problem, as noted in our earlier reports from 2012, 2015, and 2016. In this Mott Poll, 1 in 6 students (18%) at both the middle and high school level are not participating in any school activities for the 2018-19 school year. The income gap persists, as students from households earning less than $100,000 have twice the level of non-participation as their peers from wealthier households. Two key parent attitudes that may explain some of the discrepancy. Nearly 3 in 10 parents (29%) said the cost of school extracurricular activities is higher than they expected, and 10% of parents said the benefits of school activities are not worth the cost. The children of parents who express either of these attitudes are less likely to participate in school activities. Parents concerned about cost may not be aware of no-cost activities or knowledgeable about fee waivers. Only 7% of parents who responded to this Mott Poll had ever requested a waiver or scholarship for participation fees. In contrast, nearly one quarter of parents were “missed opportunities” for assistance: those who didn’t know about waivers (19%) and those who were not comfortable requesting one (5%). School officials can address the ongoing problem of non-participation by informing students and parents about no-cost activities, as well as waivers and scholarship options, and by emphasizing the benefits of school activities to parents who may be hesitant. This Mott Poll also highlights the continuing trend of sports being more expensive than other types of school activities. The average participation fee was substantially higher for sports than for arts or clubs, as was the total cost of participation, with little difference between middle and high school costs. Also concerning are trends over time. A previous report for the 2015-16 school year found an average sports participation fee of $139; that average fee increased to $161 in this current Mott Poll Report, while the average fees for arts and clubs did not increase. The same pattern occurs for total costs. Moreover, no-cost options continue to be less common for sports than for arts and clubs. The higher costs of sports, compared to other activities, may be contributing to the higher level of non-participation among boys. Boys have slightly greater participation in sports activities overall compared to girls (53% vs 49%), and more boys than girls participate in sports only (21% vs 10%). Thus, the disproportionately higher cost of sports may be more likely to impact boys. Are pay-to-play extracurricular activities fair for all students? This report presents findings from a nationally representative household survey conducted exclusively by GfK Custom Research, LLC (GfK), for C.S. Mott Children’s Hospital. The survey was administered in October 2018 to a randomly selected, stratified group of parents age 18 and older (n=2,007). Adults were selected from GfK’s web-enabled KnowledgePanel® that closely resembles the U.S. population. The sample was subsequently weighted to reflect population figures from the Census Bureau. The survey completion rate was 60% among panel members contacted to participate. This report is based on responses from 961 parents who reported on 1,323 children in middle or high school. The margin of error is ±1 to 6 percentage points. Clark SJ, Schultz SL, Gebremariam A, Singer DC, Freed GL. Pay-to-participate: Impact on school activities. C.S. Mott Children's Hospital National Poll on Children's Health, University of Michigan. Vol 33, Issue 5, March 2019. Available at: https://mottpoll.org/reports/pay-participate-impact-school-activities.